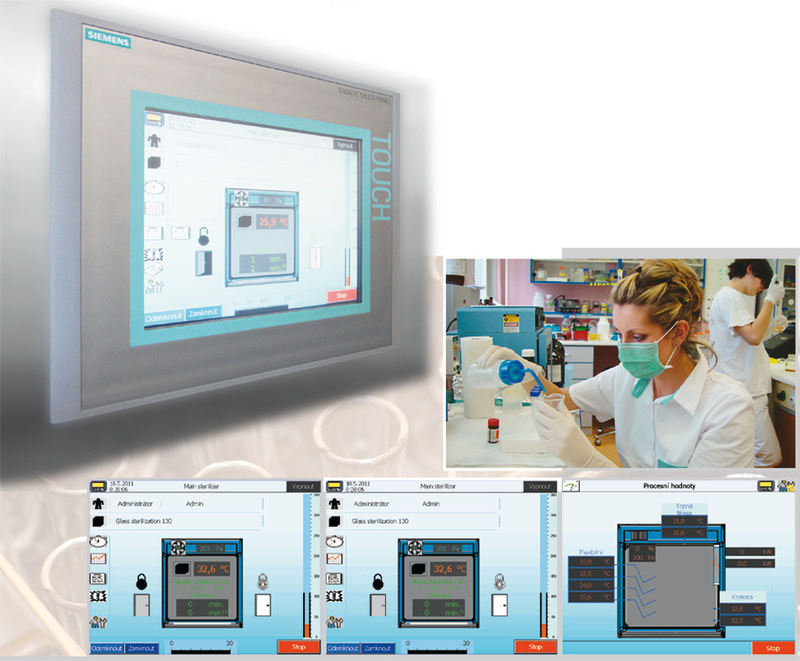 The tests and validations are performed by our accredited testing laboratory according to the standards. 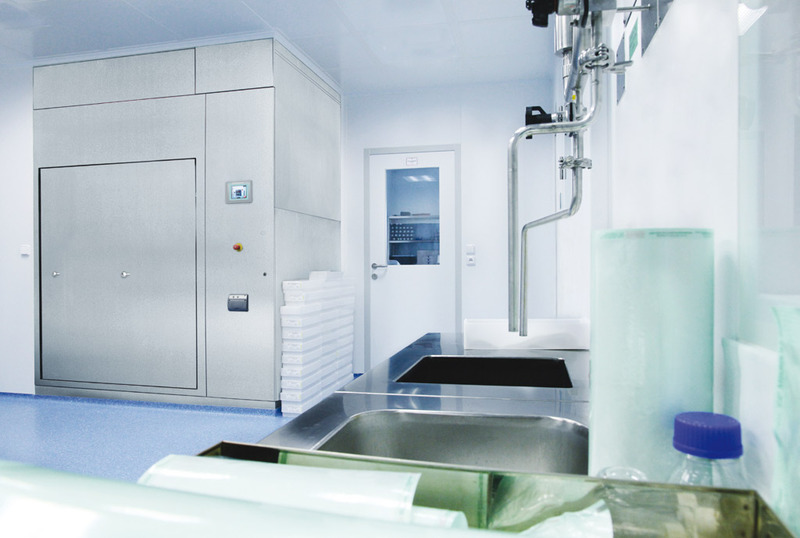 Sterilization is validated process used to render a product free from viable microorganisms. According to EN 285. 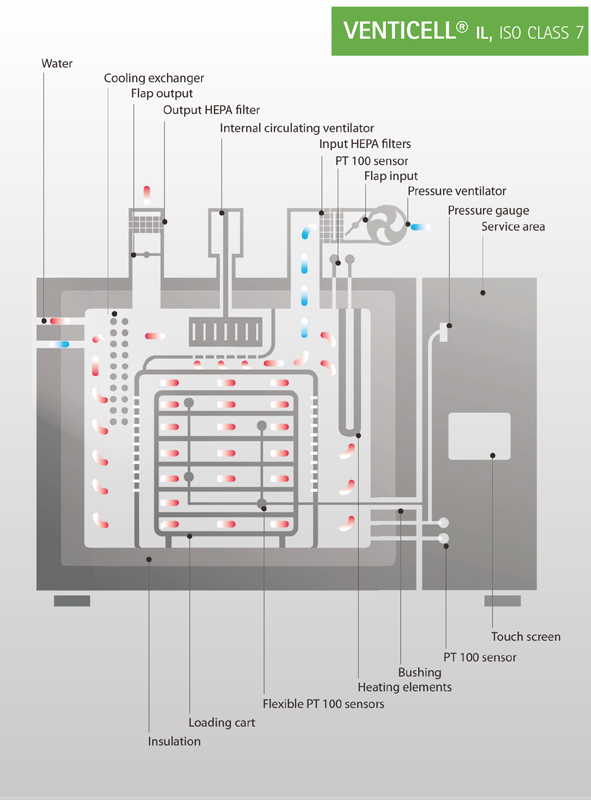 The sterilization effect in hot-air sterilizers is reached by the sterilized material heating to high temperatures (160—180°C). 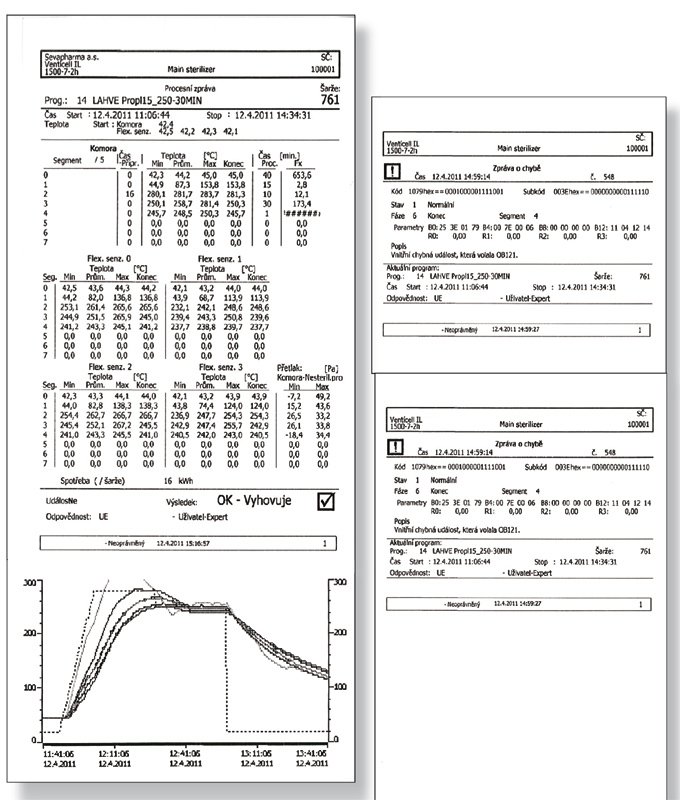 Depyrogenation is a procedure reducing the number of bacterial endotoxins (pyrogens) by at least three orders by high temperature (250—300°C) acting for a given period of time. 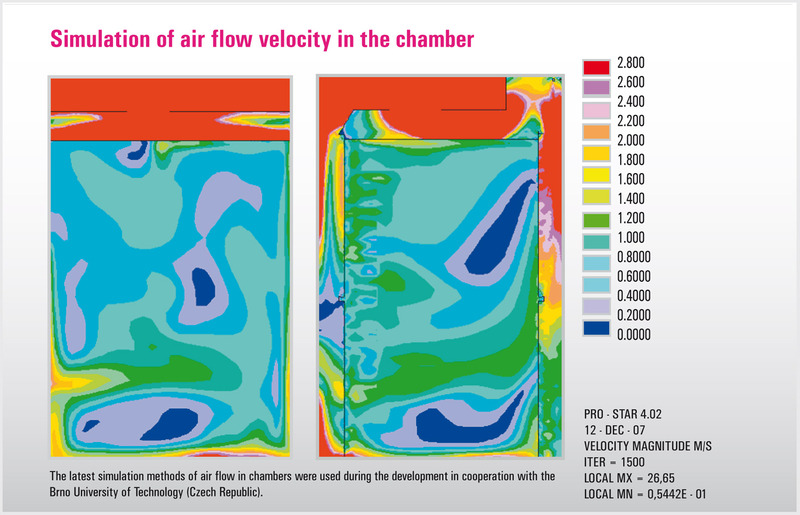 The activity is based on horizontal air flow through air ducts in the back and side device walls by means of a blower in an electrically heated chamber. Thus the spatial air temperature deviation and accurate temperature profile are ensured. 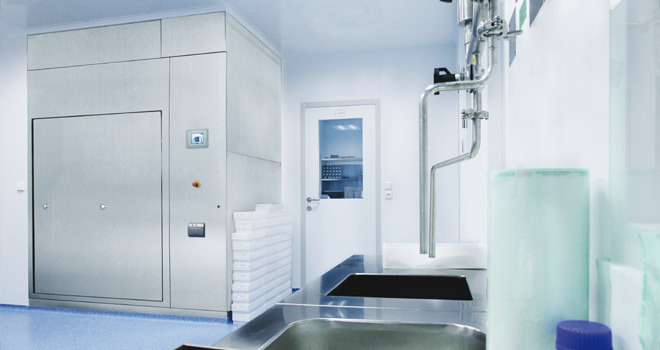 Sophisticated placement of the ventilation air ducts, heating elements, internal blower and adjustable air suction flap and discharge allow fast temperature rise and accurate cycle course in the sterilization chamber. Forced air cooling by an overpressure blower during the final cycle phase ensures the resulting reduction of necessary working cycle duration (e.g. 320 bottles ROUXE 1000 ml, sterilization 250°C / 30 minutes, cooling by air to 90°C, cycle duration 4 – 6,3 hours depending on the flow intensity). Temperature range up to 300°C allows the device use in the whole spectrum of industrial applications including the hot-air sterilization and depyrogenation. 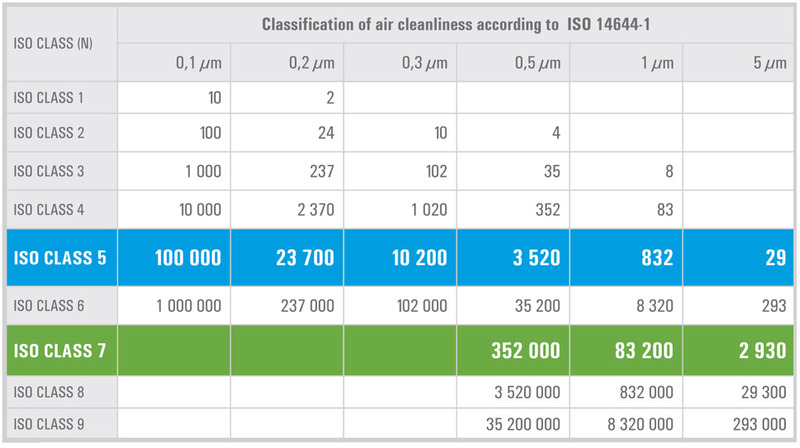 Thanks to special two-stage HEPA filters of class H 11 and H 14 placed at the air inlet into the device, the requirements of the standard EN 14644, ISO Class 5 and 7, have been met. 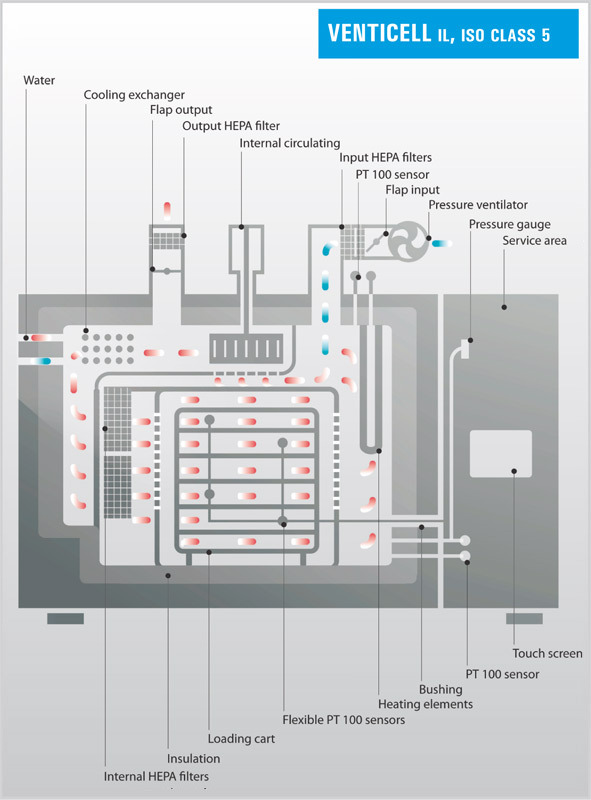 The use of thermally resistant internal HEPA filters H 13 and fluent air flow regulation allow arrangement of perfect continuous cleaning of the inner chamber, thus reducing the particles occurrence during all the cycle phases (only VENTICELL® IL, ISO Class 5), which means compliance with EN 14644, ISO Class 5. The additional overpressure blower ensures overpressure in the chamber 0,45 - 1,5 mbar. 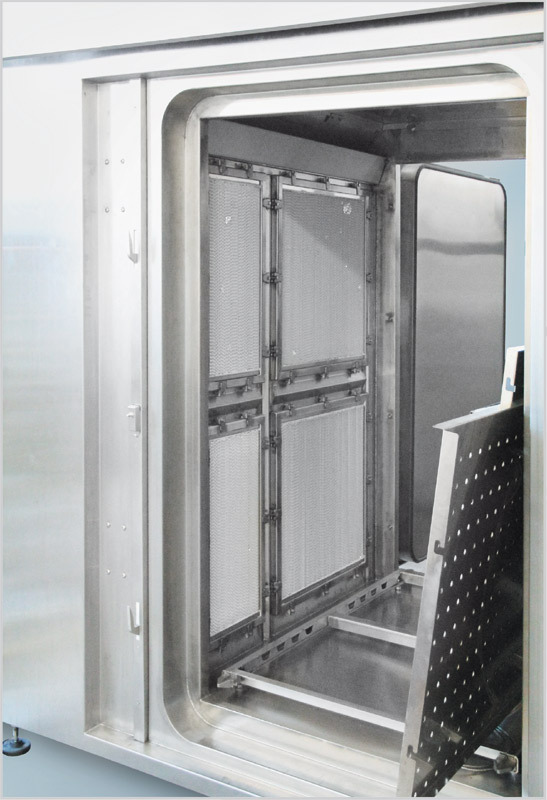 Door sealing and special sealing of the blower axis eliminates any contact with the outer atmosphere during and after the sterilization cycle. The output device pipes can be equipped with additional H 13 filters. 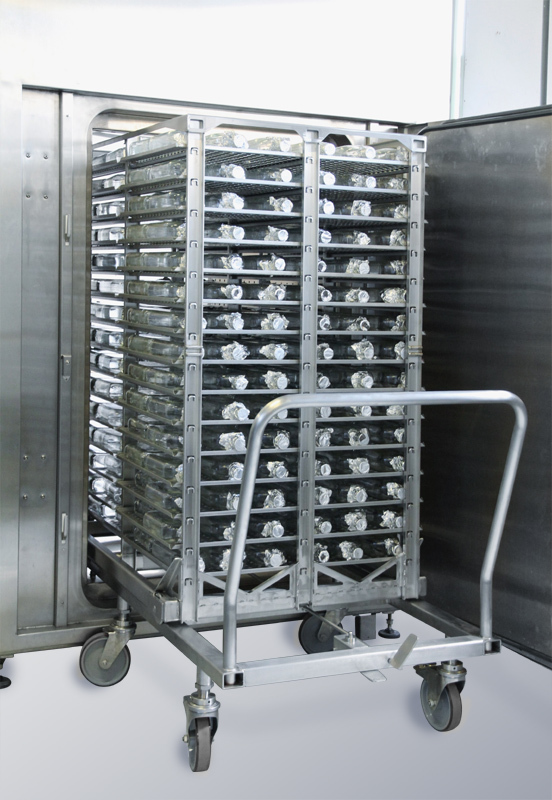 The sterilized material handling is facilitated by a loading system consisting of a transporting and loading cart. The transport cart construction has been designed to ensure a very stable load handling, even if it is quite heavy. The loading cart with shelves of optimized size for standardized containers loading is equipped with wheels with special thermally resistant bearings, which guarantees the load placement into the device without any risk of particles release from the cart. 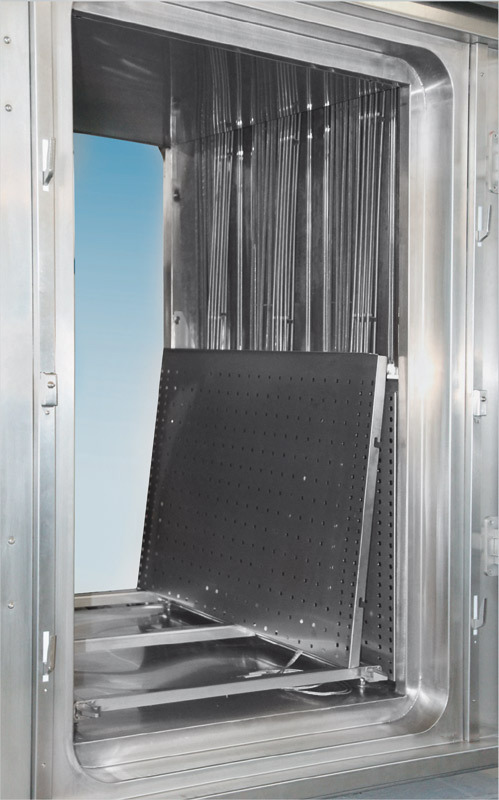 The loading device construction allows continuous air flow in the chamber, thus contributing to the working cycle duration shortening and temperature homogeneity increase in the sterilization chamber. Both the device production and the devices as such comply with the strictest ecological criteria. They do not burden the working and living environment. Multi-stage controlled cycle and continuous regulation of the revolutions rise and run-out prevent useless power surges in the customer's power supply mains. The design of the device construction, e.g. 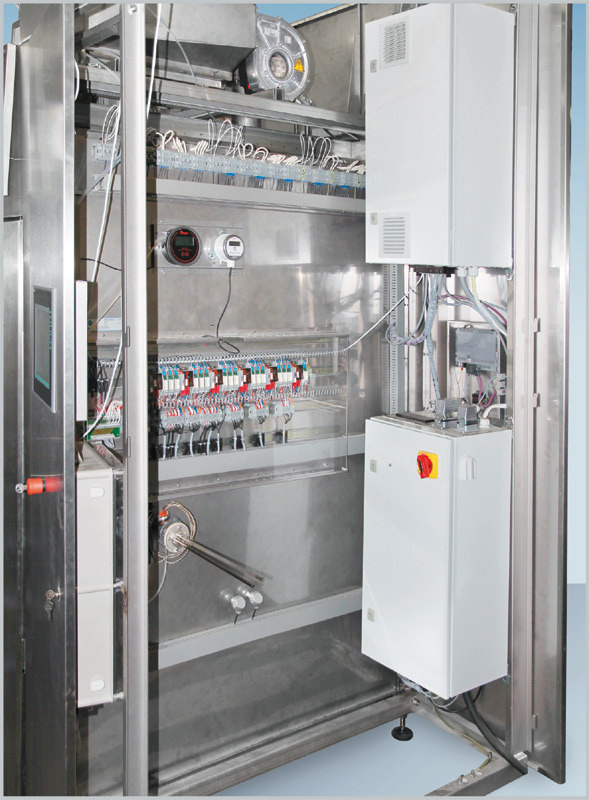 an effective flow in the chamber, perfect and extremely thick outer insulation of the sterilization chamber by the rock wool, ventilator axis sealing, or settable suction an exhaust flaps not only optimize the cycle parameters, but also minimize energy consumption and protect the user's premises from uselessly radiated heat. The heat insulation keeps its perfect insulating properties even in high temperatures when it retains low temperature absorption. During operation, it does not release any smell or smoke emission because it contains neither binders, nor lubricants. The device does not produce any harmful by-products. Ecological processing methods are used during its production. More than 90 % of the device and its pack are recyclable. The device contains neither any harmful substances nor heavy metals and complies with the directive on the restriction of the use of hazardous substances and wastes no. 2002/95/EC and 2002/96/EC. varnished or stainless steel covering strips for device installation into the wall.